AN to NPT pipe adapters from Fragola are made from high-quality Anodized Aluminum. AN to NPT pipe adapters from Fragola are made from high-quality Anodized Aluminum. These AN to NPT pipe adapters from Aeroquip are made from high-quality anodized aluminum to precise aerospace tolerances. 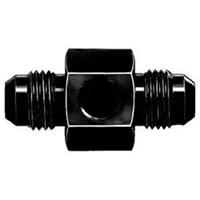 These AN to NPT pipe adapters from Aeroquip are made from high-quality Zink Plated Steel to precise aerospace tolerances. Female hose connector to male pipe fitting.